Some people have been wondering "How do we support Local Industries in Egypt when the quality isn't that good"
Well, that's not true on all aspects, and let me explain with an example, the Textile Industry. I think it's about time our obsession with brandnames and such comes to an end. And about time we created our own local brand names. I'll give you an actual example. Hilfiger T-Shirts and various tops are actually made in Egypt. 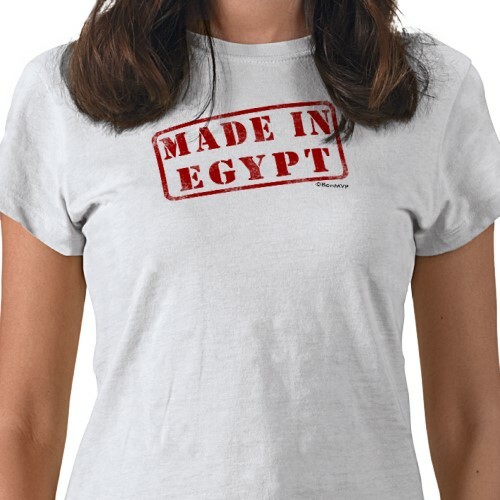 In fact they're made, and sold here in the USA (and other countries) with tags that have "Made in Egypt" or "Made with Egyptian Cotton" on them. Those same shirts and tops are then sold to Egyptians at a much Higher price because they're "Hilfiger"
And yet if the SAME exact factory made shirts and tops without the "Hilfiger" tag, no one in Egypt would buy them. Is it because no one has faith in the quality of our products, or because of the brand name? Now with the corrupt regime failing, It's only a matter of time before visionaries that were previously suffocated by the regime, will start creating Egyptian brands, and when that happens, it'd be a good idea to support them. Our local textile industry has been suffering for a while now and it's about damn time we support it. Agh, I had a great long reply then blogger lost it! Basically I agree with all the above and that the quality of clothes made in Egypt for the Egyptian market be of the same quality as for export. People have shown they're ready and willing to buy local-handmade jewellery etc with any luck this will spread to other areas too.